Popcorn Hostel is unique to Haeundae Beach, Busan in that everything is large and spacious. You will be able to not only fit your luggage inside your room, but you will still be able to walk around! Forget about the inconvenience of leaving your room to use the toilet- every room has a bathroom en suite! Never shower over the toilet or sink again! Bathrooms are large, bright, and beautiful. And what other hostel is going to have those luxurious rain shower heads?! 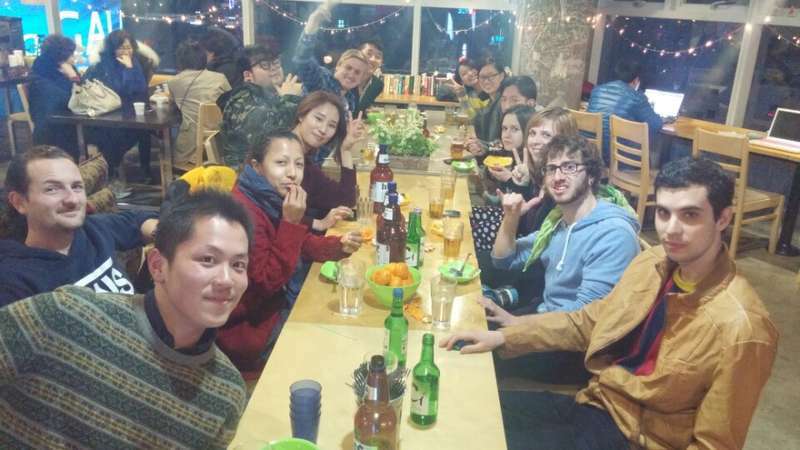 Our hostel offers a unique and local stay experience with inexpensive, safe, clean, and fun accommodation. Immerse yourself in the urban-chic interiors of our high-rise building, which reflect that modern energy South Korea is known and loved for today. Our large establishment has room for 80 people, but we still strive for a very personal, friendly, and neighbor-like involvement. We have a large lobby and common area that has the feeling of a modern café. 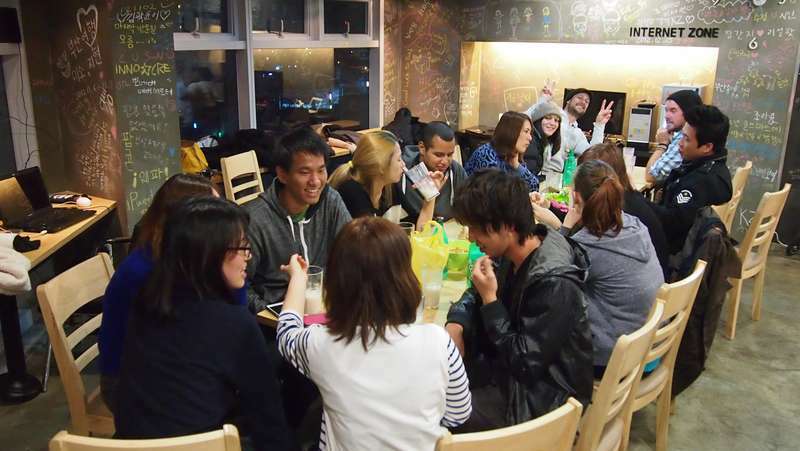 Guests can meet and socialize, eat and drink, and play one of our many games. You can enjoy the view and see some of the ocean from our large 11th floor windows, which is pretty rare for a hostel! 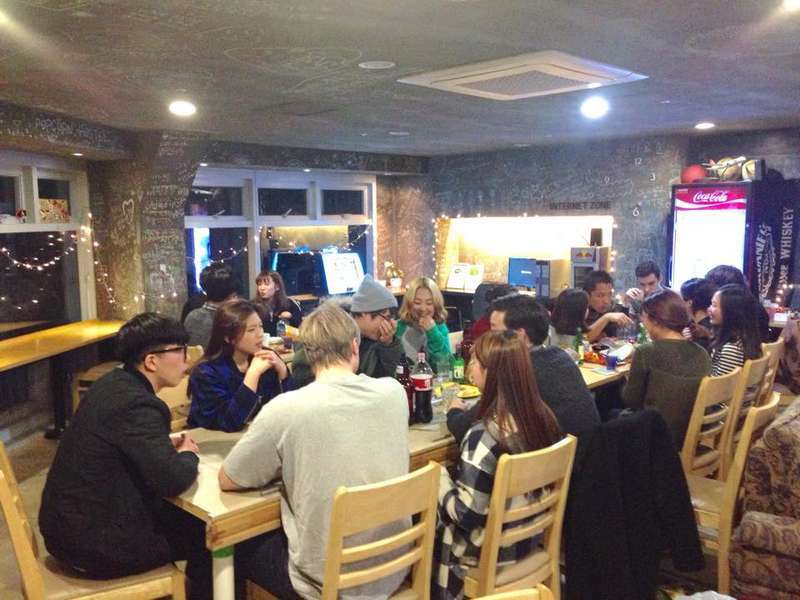 Popcorn Hostel is a popular international guesthouse located near Haeundae Beach (2-5 min. walk). If you love the sea life and want to enjoy the sun, relax on the beach, and try seafood straight from the ocean, then Popcorn Hostel is just for you! -Popcorn Hostel is at the second intersection past Novotel on the left side. We are located in the Marine Tower Building. -Take the elevator to the 11th floor for reception. - Takes about 1 hour. -Take Subway Line 1 (Orange) towards Seomyeon/Nopo. -Transfer at Seomyeon Station to Line 2 (Green) towards Haeundae/Jangsan. -Get off at Haeundae Station. - Walk straight (towards the beach) until you reach the end of the road. -Turn left and continue straight to Marine Tower. Go up to 11F. - Cancellations made 24 hours before the day of check in will result in a non-refundable, 100% charge for the first night’s stay. - Cancellation 2 days - 6 days before your check in day will be 50% refundable. - For a full refund, cancellation must be made 7 days prior to local check in time.